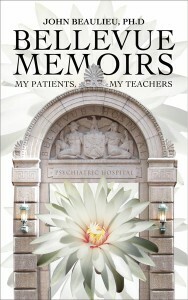 Bellevue Memoirs is Dr. John Beaulieu’s new long awaited book of heartwarming stories of his patients at the famed Bellevue Psychiatric Hospital in New York City. Coming from Indiana to New York City, John’s stories of how his patients taught him lessons of caring, love, courage, and humor touches the hearts of all of us in ways we will always remember. We see how behaviors defined as psychiatric disorders reach deep into the lives of us all, in all the things we do, and how the edge between sane and insane can easily become blurred at times. We can honor ourselves in these stories and discover a fine thread that separates and ties us all together. A must read, this precious little book of stories will stay with you, they will make you smile in the darkest hours and in the brightest of moments.